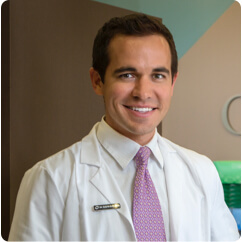 Dr. Dustin Burleson and his staff are changing lives through better smiles every day. Combining automation with a passion for customer service, the business has enjoyed explosive growth and a stellar reputation. Burleson Orthodontics takes patient satisfaction seriously. The business's "have braces without missing school or work guarantee" attracts thousands of busy families seeking orthodontic care every year; delivering on that promise requires the business to run with total efficiency, and to place customer care at the center of everything they do. It all starts with the customer-centric attitude of founder Dr. Dustin Burleson. "We help children show up to their first job interview with more confidence, or go on their first date, or raise their hand in class. A chance to change a kid's life is really powerful," he says. Driven by his passion to improve the lives of as many children as possible through orthodontic services, Dr. Burleson tried a number of basic email marketing solutions to connect with potential patients. "We tried them all," he says, "and they were really limited in automating more than just a few steps of our email process." "Frustrated by the limitations that other solutions put on his business and driven by the need to put every component of his marketing under one system, Dr. Burleson calls his decision to switch to the Infusionsoft platform "a no-brainer." Initially, he was inspired by how Infusionsoft community members were using the software in other verticals. His spirit of innovation kicked in, and Dr. Burleson began to wonder if the same sales and marketing tactics could be applied in the field of orthodontics. Now, the practice has grown to four locations and automates everything from lead nurturing sequences to patient follow-up and even employee training. Burleson Orthodontics' website offers information not just about it services, but about how patients can improve their overall dental health, including articles, blog posts, and videos. Today, Burleson Orthodontics employs Infusionsoft's automation capabilities throughout the business. Leads come in from various channels—Facebook, PPC and direct mail—and are captured through web forms that tag their source and other factors. This triggers an automated, targeted nurture campaign that converts an astounding 85% of leads into patients (national average in his industry is 50%). Dr. Burleson even automates his employee training, informing them of company benefits, resources, and other updates at scheduled intervals. With a planned marketing and the technology required to execute on it, it's no wonder that Burleson Orthodontics grew from 180 to over 1,500 patients in just one year. Of the leads who don't convert after initial contact, over 20% do so during a reengagement campaign. The focus on care for the individual has been particularly critical to the success of the business; automation has enabled Dr. Burleson's team to provide individual communications to every contact, without the considerable effort required to do so manually or with less powerful systems. Burleson Orthodontics uses segmentation to manage its patient follow-up communications, with smart automation triggers designed to reach patients based on treatment type, referral status, treatment start dates, key milestones, and more. Pre-set actions kick off a reminder for staff to send greeting cards with thoughtful gifts at key points in treatment. For example, after a patient has braces put on, they receive a gift card for a smoothie to help soothe any discomfort. And after braces are removed, the patient receives a gift card for a free caramel apple. Of course, happy customers equal referrals. Thanks to the team's success in providing excellent service, 60% of patients refer new patients, up from 28% before the business used Infusionsoft. "Infusionsoft is our sales force. It's unbelievable how it automates the sales process and follow-up," reports Dr. Burleson. After three years with Infusionsoft, he has plenty to smile about. Revenue is up 180%, cost per customer is down 56%, and Dr. Burleson has more time than ever to spend with family. Additionally, Dr. Burleson can dedicate more energy to his two charitable organizations, Smiles Change Lives and the Cleft Palate Foundation.